Good Morning, Friends! I apologize, again, for taking so long in getting this post up, but as I said on Shoestring’s Facebook page, this is a piece a intend to have for a long time and that I use often so I wanted to finish it just right..That being said, It’s DONE!! I have had this kitchen table for 10+ years and I still love it!! I’m sure you have either seen this table or a version of it before. It was one of the first “Country Cottage” style pieces that was available, at a reasonable price..
the company had made them all in white. I never have seen one to this day that is solid white. Now, armed with a little more knowledge and Behr’s version of ASChalk Paint, I felt prepared to make it the table and chairs I had always wished it would be. It was not at all as easy as I had thought it would be. First of all, they had a really high gloss thick varnish on the “oak” parts of the table that didn’t take to my original plan. I had intended to paint some black paint on the areas I had hoped to later sand of to give it that perfectly distressed look. However, this table had a mind of its own. (I have used this method before, with applying a very thin layer of petroleum jelly or even was over the black and then painted the white chalk over it, and found it worked lovely at letting the darker color come through, as this is a very blonde oak.) When I attempted this method with this piece the chalk paint actually started rubbing off the black and pulling the paint. So I scrapped that idea and sanded off the areas I had prepped for this finish. Starting back, basically, and the beginning. 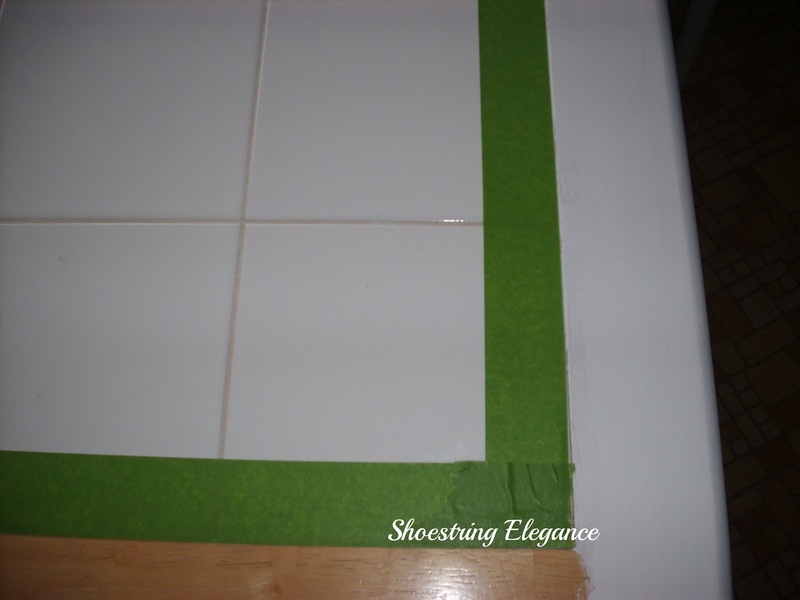 As I love the white tiles and wanted to make sure not to damage then in any way or the surrounding grout, I taped it off so just the border was exposed and beginning redoing the edges again with my chalk paint. I have never had to use more than 2 coats to completely cover a surface before, but this table required three and then sanding, waxing and sealing. However, now that it is done, I have to say, I Love It!!! It was well worth the extra work! I am aware that some of my projects are not technically difficult to do. But, that, in fact is the point!! To take what we have(or what we can get very inexpensively) and make it what we always wanted to be!! And No, I don't always have my Teacups and table set this way, but it's so lovely to know that I can, now that it's been 'upgraded'. The more you put out, the greater you get back!! I hope you will enjoy this as well!! And I hope that you are all enjoying a Blessed week!! I keep updates and additional pictures on Shoestring Elegance’s facebook page if you want to go “Like” it there, you will see in your feed when I have a new project up. I also add a few other tidbits, and inspirations there. Come check it out! I love your comments!!!! If I haven't answered your comment directly, in the past please forgive me, it isn't that I wasn't Blessed by receiving your kind words, they mean the world to me! It is just a lot to keep up with!! Thanks you for coming to visit my little corner of the world! I hope you'll stick with me through this wonderful journey! I like it much better! And I love the teacups! Oh, what a wonderful job have you made of your table set! I love all white too. I have been wanting to paint my set for years but I can't do those things any more for health reasons, unfortunately. Most likely I will have to pay someone else to do it for me. Anyway....I loved seeing your lovely teacups all sitting out on your pretty table! What a charming picture they make! Thank you for sharing and coming by to have tea with me. Have a beautiful day. Sandi, Thanks so much for coming by and leaving me a note I was so excited to get to hook up with you for tea. I always so enjoy visiting your Rose Chintz Cottage!! I wish I was closer I would happily paint yours for you. Imagine the fun we could have!! I loved getting some of my tea cup collection out on display. You know I left them out and used them so I could enjoy their beauty just a little longer. I much prefer the table completely in white and it's just the right size to share tea with a friend or two. Thanks so much, Lavender!! Yes, you're right it is just perfect for that.. 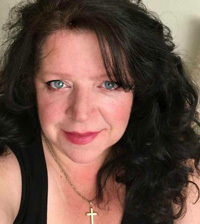 I have family in Ontario, I wonder if they know what a gem of a blog you have. 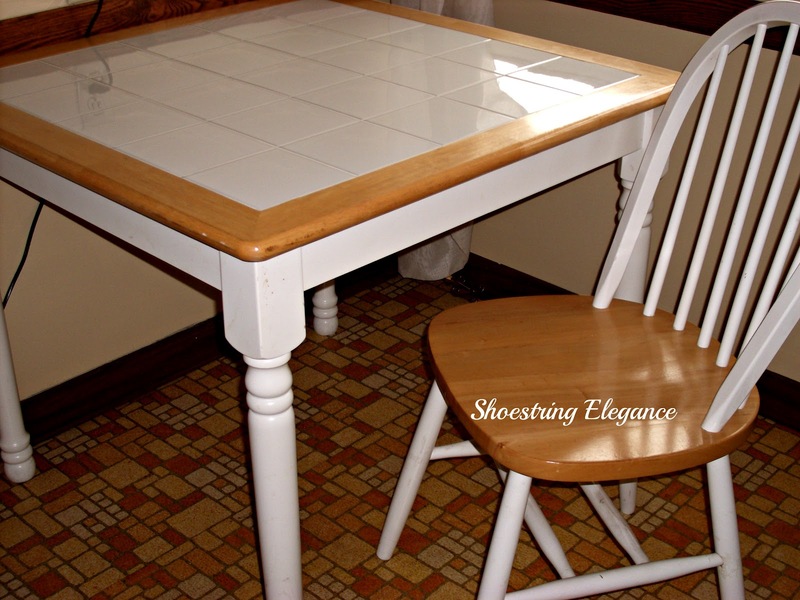 we have a very similar version of this table..with the wooden trim. I love the all white...just gorgeous!!! never considered doing what you did...thank you!! Thanks so much! nice blog, now I'm following you! Lovely! I think your table turned out beautiful. You did a great job on it. 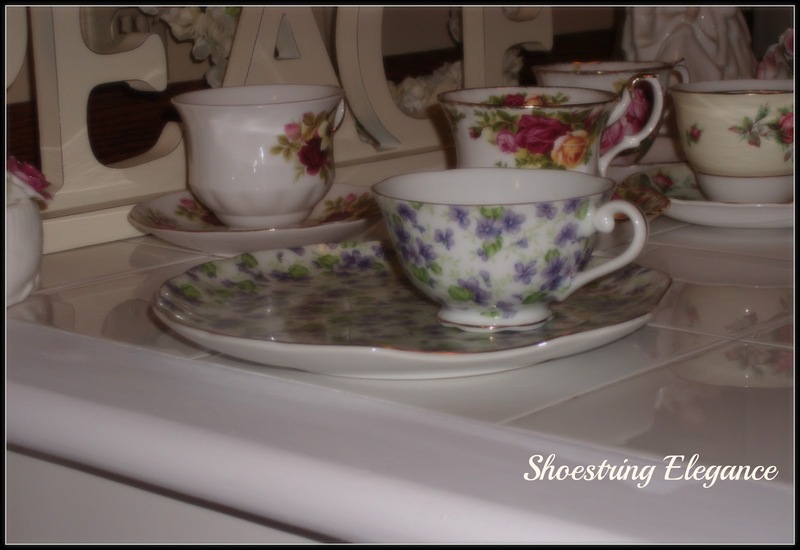 Your tea cups look gorgeous on it too! Thanks so much, Terri!! Im so glad you liked it, I'm quite happy with the end result, too!! Your table looks great all white. The tea cups displayed are gorgeous. 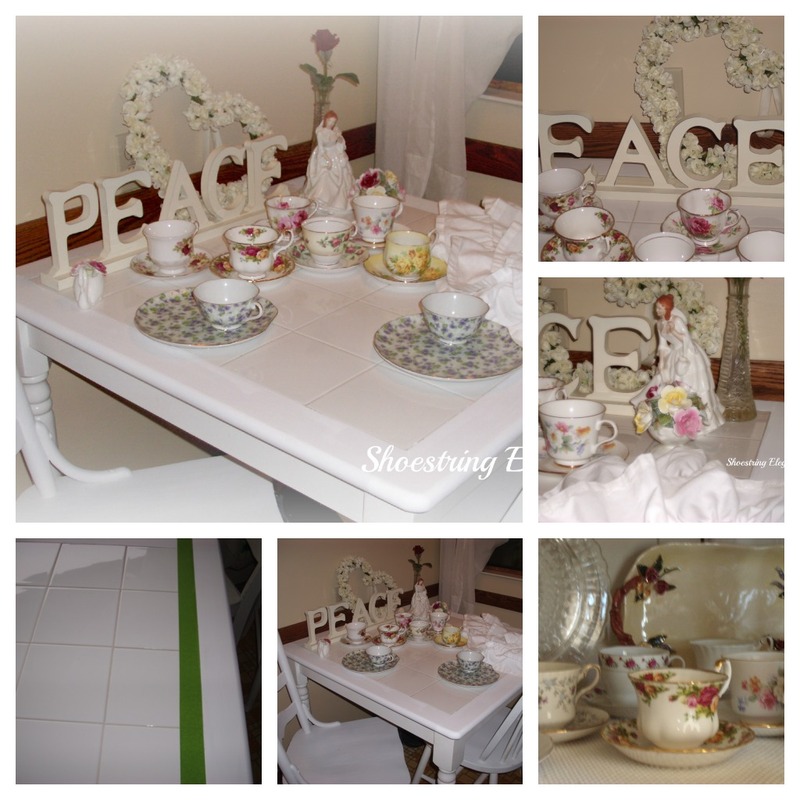 Love the Peace decor, too. I love it in white. I've never liked the light wood with the white tiles. Your version is so much better. Thanks for sharing at the All Star Block Party. Thanks, Holly! Me either was so so happy this worked. Thanks for letting me link up with you! Love the table, looks wonderful. Great tablescape too. Thanks for joining TTT. Oh that looks lovely! Makes me want to sit down and have a cup of tea with you! Found you on the All Star Block Party. I'm so glad you found me!! I have tea at that spot often, now! It turned out gorgeous! Thanks for sharing! Thanks, Jennifer! So glad you liked it! so pretty! the fresh paint helps hide the tile top, too! Thanks for popping over, Cassie!! Glad you liked it. 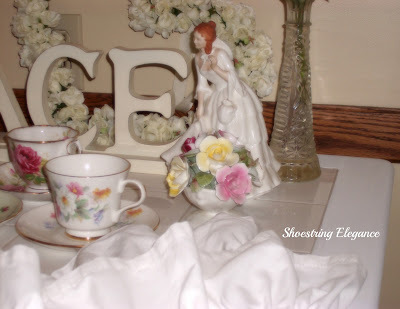 This is very pretty, Theresa, and I like your tea cup collection--delicate and beautiful! Thanks Athena! Loved your Lampshade!! That turned out so beautiful you are incredibly talented, lady!! Happy to have you here. A very nice presentation today. I really enjoyed my visit and seeing all the things that you treasure. So lovely and serene! Great job! WAY TO GO!!! It looks GREAT!!! Love the chairs too! Your table and chairs look lovely! Much more elegant the new way! Thanks so much, Helen!! I'm so glad you liked it, too..I love it, I agree with you, it does feel more elegant. Thanks so much for coming to visit!! You are so talented in many ways. Did a great job on the table. Looks very nice. I'm with you -- take whatever time necessary to get things done just the way you want it! Turned out beautifully -- worth the time and persistence. 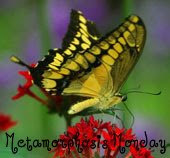 Thanks so much for linking on Busy Monday! Thanks for your wonderfully kind words, Charlene!! Yeah, I can't just rush through these "projects" I'm doing them to upgrade my home, have to have them right. Thanks for having me on your beautiful Blog! The after looks so elegant with the addition of paint! And even though your project was about non-color ... thank you so much for sharing at our Crazy for Color link party! It looks lovely, and I love your teacups! Thank you for linking this up to Rustic Restorations Weekend! I love your new table. I was thinking about painting mine too. It looks so good with yours and also I love your new chairs. Very French too. Did you know you can paint on tiles? There is a translucent primer you apply that makes it possible to trace with a pencil and you can also decal some pictures and paint it. Anyways. Thanks so much for linking. This is super!!! Non-color is the new color!! It's the perfect backdrop to your fabulous teacup collection! So glad you joined our Color party! Absolutely beautiful. Thanks so much for sharing this beautiful table at "I Gotta Try That" Have a great day. Great job Theresa! 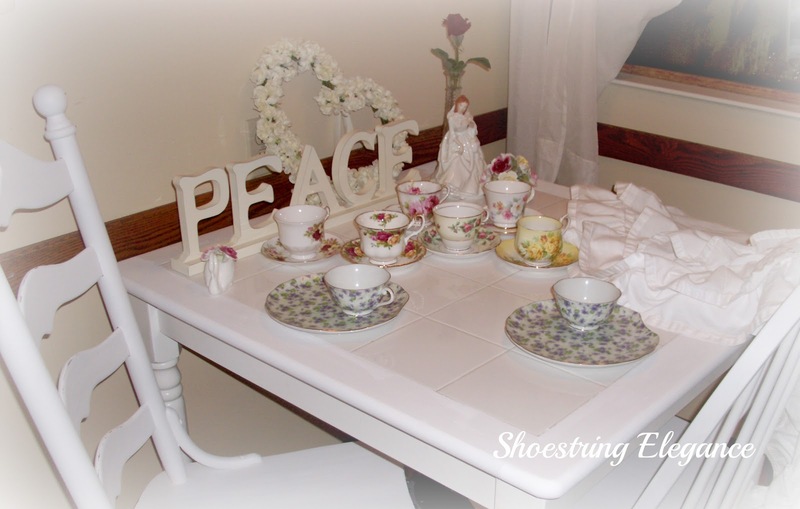 Your teacup collection looks lovely on your new white table. Thanks for sharing on Simple & Sweet Fridays. hope to have you again this week! You did an incredible job! What a gorgeous finish! Always love to see creative minds at their very best! Have a great week! That is beautiful work on the table and such a pretty table setting! I appreciate your effort in doing this blog. Indeed helpful. Thank you for visiting Determined to Cure and commenting and following! And thank you for following my Facebook page. I really appreciate your support! Your comment meant a lot. My Version of an Old Classic Vase!! Garage Sale Stand <$5, but Free To Me!